Very rich landowners and hundreds of servants lived here in splendid houses overlooking the river. Some 5,000 m² of vestiges remain and there is also a museum showing the day-to-day life of the owners and the people who served them. We begin our discovery of this site by immersing ourselves in a 3D digital presentation of a 2nd century villa. The rest of the museum is located in part of the former presbytery and displays a collection of items found during archaeological digs. Reconstituted wall paintings are found on the ground floor. The remaining parts are spread on a canvas, which makes it possible to have an idea of what the original looked like without having to complete the works artificially. You can thus see patches with a candelabra surmounted by a doe or the head of an angry god. Surprisingly well-preserved mosaics from the Gallo-Roman villa of Plassac. 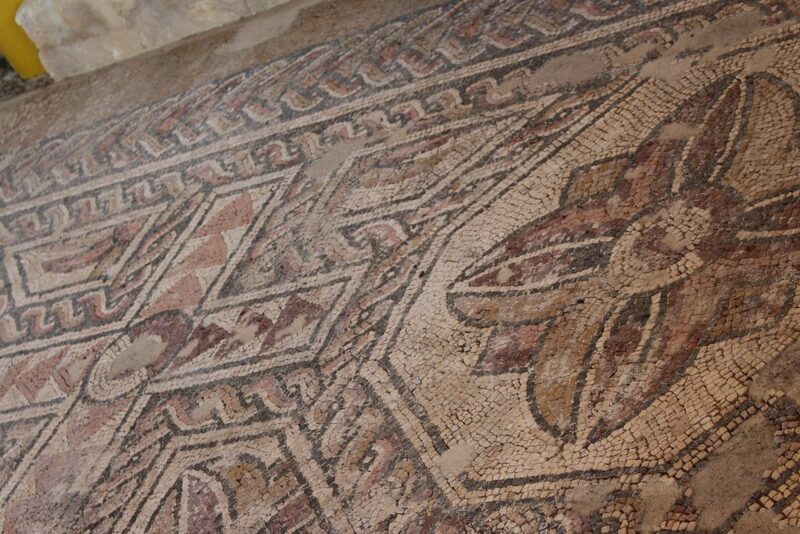 The same treatment is given to amazingly well-preserved mosaics. A video shows how entire swathes of ground were able to be removed at a time in order to be cleaned and put onto a new backing while waiting to be returned to their original place or exhibited. The villa’s mosaics, which have become largely unstuck over the centuries, were, in fact, easy to remove. Specialists had only to roll up most of the largest frescos! On the first floor, ten display cases contain fragments of everyday items used by the villa’s inhabitants: amphorae, coins, tiles, ceramics, and bronze statues reflect the owners’ wealth. A panel explains how the two underfloor heating systems worked and convinces us that this was indeed an architectural gem. Our guide, a volunteer belonging to the Association des Amis du Vieux Plassac, points out the meaning of the word villa. Not just big houses, as we imagine today, Gallo-Roman villas were large farming estates belonging to rich families. The remains of walls found on the archaeological site show the huge scale of the estate. The first impression one has arriving from the corniche overlooking the site is its sheer size. The view of the estuary is magnificent, and our virtual tour proves very useful to imagine what the villa looked like in its heyday. While it is easy to see why the Gallo-Romans chose this location to build their architectural masterpiece, it is less so to form a mental image of the celebrations that took place there, the ornamental ponds, the patios full of flowers, etc. In any event, after taking a closer look, it is clear that an incredible job was done restoring and preserving the vestiges. Over 100 m² of mosaics are visible thanks to a platform that not only protects, but reveals beautiful geometrical motifs to visitors. The remains of walls are visible here and there, as well as terra cotta or white stone conduits used for the omnipresent underfloor heating. Small canals running all around the villa show how much care was taken in blending greenery, luxury, and water as a decorative feature. Virtually unobstructed by houses built on the grassy plateau levelled by the Romans, the view from the end of the grounds is splendid. Our guide regularly points to a sketch of the villa as it was in the 2nd century AD and one of the three houses succeeding one another that left the most traces. This enables us relate to the 3D tour and visualise 5,000 m² of gardens, mosaics, decorative pools, peristyles, and reception rooms. Before leaving, our guide explains that part of the villa is still buried underneath the neighbouring church and private property. Like many great discoveries, the villa’s existence was found by accident. A winegrower was intrigued by tessera that appeared when he ploughed his vineyard. He agreed to uproot his vines and for archaeological digs to be carried out. These unearthed the ruins of the villa, which had been mentioned in documents dating from the 7th century. In fact, seeing the virtual tour helped us to visualise the house as it was in Roman times and the work that has been done since the 1970s to preserve the vestiges. The site was developed to enhance its natural beauty as much as possible, leaving it very open and covering only those parts that need to be protected. The intelligent architectural options that were chosen give visitors a very good idea of how large the original villa was, as well as a good overview. Arriving on the crest of a slope, a panoramic vista of the estuary and outline of the walls gives visitors an inkling of the wealth and power such a house represented at the time. Cost: Full price: 4 euros – Concession: 2 euros – The last tour takes place 45 minutes before closing time.